Human Development Centre is working in Toba Tek Singh since 1990. Action Aid Islamabad is one of the partners of HDC to support the activities and programs. Action Aid works with the CBOs, NGOs on the long and short-term basis. Where Action Aid Islamabad works on long-term basis, it is called Development Area. At the moment, Action Aid Pakistan is working with 18 organizations through the country. Human Development Centre is one of the DA and its number is DA 11. The vision of the Action Aid is poverty eradication and promotion of education. DA 11 is working on the same lines to promote education and eradicate poverty through different activities and program. · Four Para-vets trainings have been conducted and 52 participants came to attend these trainings. These programs were held in different places,: Chak No. 331 GB, at a local Hotel in Toba Tek Singh. Dr. Tahir Raza was the resource person. · One Demonstration farm has been established in Chak No. 291, Lahorain. Mr. Muhammad Yasin is the owner of the land. This farm is not that successful because irrigation water is not sufficient. The land is saline and it is not fit for the crops. The land units are too smalls (2-4 acres) and the farmers do not agree to make any experiment. The use of fertilizers and chemicals in the past has affected the land badly and affects the yield. · 56 women have started kitchen gardening in their homes; these women have grown vegetables and small plants. This kitchen gardening is contributing to help improve the financial condition of the family and also keeping women busy and involved in a productive activity. areas participated in this training program. · Three Teacher Rights Based training programs were conducted for the private and government school teachers. 87 teachers (55 females and 27 males) participated in these training programs. Teachers training programs were held in Chak No. 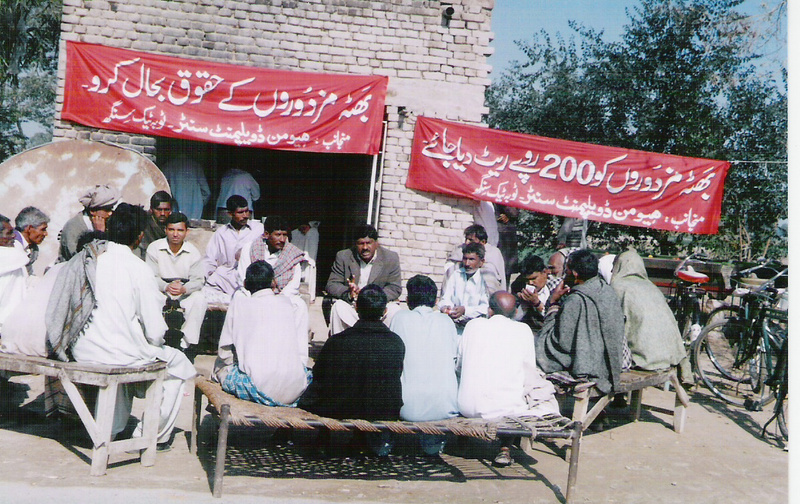 295 Barianwala Toba Tek Singh, Chak No. 331 Toba Tek Singh and Gojra. The contents of the trainings were HRs, Education, Interfaith Harmony and peace building, Citizenship education, conflict resolution and Child friendly School methods. · Two Exposure programs for 35 teachers and students were arranged in Faisalabad and Kamalia. The teachers and students visited the different schools in Kamalia and Fasialabad. They observed teaching and learning methods of teachers. They also shared their experiences, problems and opportunities to improve the standard of education. · Five Parents/Teachers/Students meetings have been conducted in Govt. Primary School Chak No. 291 Lahorianwala, St. Teresa Primary School Barianwala, St. Peters High School Toba Tek Singh, Shaheen Public School Toba Tek Singh and Child Friendly School Teachers. 120 students/parents/teachers participated in these meetings. They shared problems and experiences regarding the education of the students. They also gave suggestions for the improvement of education. · Three Evening Classes have been held for selected students in Toba Tek Singh integrating the school curriculum with the social issues. 35-40 students were invited for each class. The contents of the evening classes were teaching through games, general knowledge, social issues, and presentation of interactive theatre and role plays, personality development and character building and promotion of values. · Five Gender promotion seminars were organized to promote gender balance in Toba Tek Singh. 230 women and men attended these programs. The resource persons talked about the importance of role of the women in different sphere of life. Women who have played significant and vital role in the development of the people and marginalized people were invited and they shared their experiences. · Four Meetings were conducted with the Government Officials. In these meetings, people from the community were also invited to share their problems. In these meetings, participatory methods were used. Government officers shared the development schemes and community asked different questions and got the clarification. Community members from the village organizations brought the matters of corruption and misuse of funds in to the notice of the district government officials. · Four discussion meetings were held with the youth in Toba Tek Singh and Gojra. The purpose of these meetings was to provide them opportunity to share what role they can play in the present and changing world. It was also discussed how the globalization is affecting young people in the world. · Four seminars/workshops were organized on the issue of human rights in the villages. The contents of these seminars were Labor Laws, Situation of sanitary worker, brick kiln workers, women issues, and Child rights. 280 people from DA 11 target areas were invited. Two victims were invited to share their cases. Brick kiln workers were invited and they shared their struggled for their rights and went on strike to increase their wages. · Two Leadership training programs with local leaders, farmers and HR activist were held in Gojra and Toba Tek Singh. The purpose of these leadership trainings was to equip leaders with skills and techniques to work in the community in a better way. The salient features and characteristics of good leaders were told to the participants. HDC organized programs on equal citizenship rights and participation of the community in the governance in the villages of Toba Tek Singh. 70 people were invited. In a workshop the role of the communities in the democratic process and governance was highlighted. The need to recognize the right of the community in the matters of the local government was demanded. · A consultation was organized on the topic of the role of religious minorities in the development of the country. 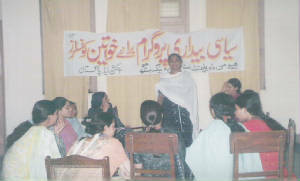 Tabasum Shahzad, advocate, addressed the participants of the program. He said the religious minorities played a vital role in the struggle of Pakistan. He talked about role of S P Singha, Jogindar Nath Mandel etc. He said that religious minorities should have the equal rights in the country as they are able to play very vital role in the development of the society as they have played their role in education and health sectors. Religious minorities belong to this homeland. He mentioned especially the role of the religious in the defense of the country, in particular he highlighted the role of Group Captain (retired) Cecil Chaudhry. · Four meetings were organized with the professors, lawyers, journalists etc to increase their role in the development of the society in Toba Tek Singh, Gojra, Jhang and Faisalabad. It was discussed in these meetings that journalists, teachers, lawyers, religious leaders, poets and writers etc can play their role in the transformation of the society. Unluckily the young opinion makers do not have role models around them and thus are unable to educate the society. Their role is very important but they need orientation on the issues based on human values and equal rights for all. Fifty opinion makers participated in these programs. · HDC organized four programs with the councilors and Nazims for their role and responsibilities. 30 Union Councilors and 20 Tehsil councilors and 8 district councilor were invited to attend the seminars. · Four programs were organized on Political Education for lady councilors in Toba Tek Singh. The purpose of the programs was to educate women about the procedure of the assembly session and rules and regulations of the assembly sessions because most of the women are new and they do not have any political background and experience in politics. The Hadood Ordinance was discussed in particular to form the opinion of the councilors against the inhuman implementation of the ordinance against women. · HDC held meetings with NGOs, and CBOs working in the DA 11 target areas. HDC invited these organizations to cooperate with HDC in the areas so that with the joint venture, development work may start on very effective basis. HDC told the CBOs that should be clear in its missions and visions and orientation. CBOs should focus on one issue and work on it. Once they are clear in what they do they can do durable and effective work for the people and society. HDC assured the organizations that HDC can provide training to this organization on the different topics. HDC will also try to find resource for these organizations.